In Taiwan, universal health coverage (UHC) is not just a goal, it is already a reality. Taiwan’s National Health Insurance (NHI) covers 99.9% of the country’s population by providing low-cost health care to its beneficiaries through a centralized, single-payer system. Built on a strong foundation of proven information technology, the system allows both administrators and patients to closely track health information and make informed decisions. Taiwan’s insurance system is perhaps most well-known for its use of a SmartCard to track patient visits and public health information. Participants watch as a doctor contracted by Taiwan NHI completes clinical review of claims at the Taipei Regional Office of Taiwan NHI. In Ghana, UHC is an important goal that is shaping national health policy. Ghana’s National Health Insurance Scheme (NHIS)—which covers more than a third of the population—is working to become a more financially sustainable organization by reforming its payment system and improving its generation and use of data for decision-making. The HFG Project has been working closely with the National Health Insurance Authority (NHIA), the governing body of the NHIS, since 2013 to achieve this goal. 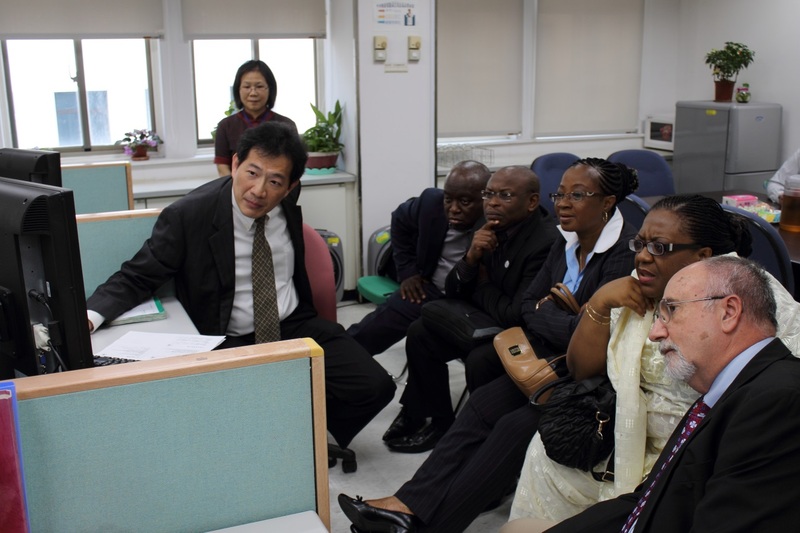 This spring, a delegation of eight Ghanaians from the NHIA, the Ministry of Health, and Ghana Health Service visited Taiwan’s NHI in Taipei for a learning exchange and study tour. 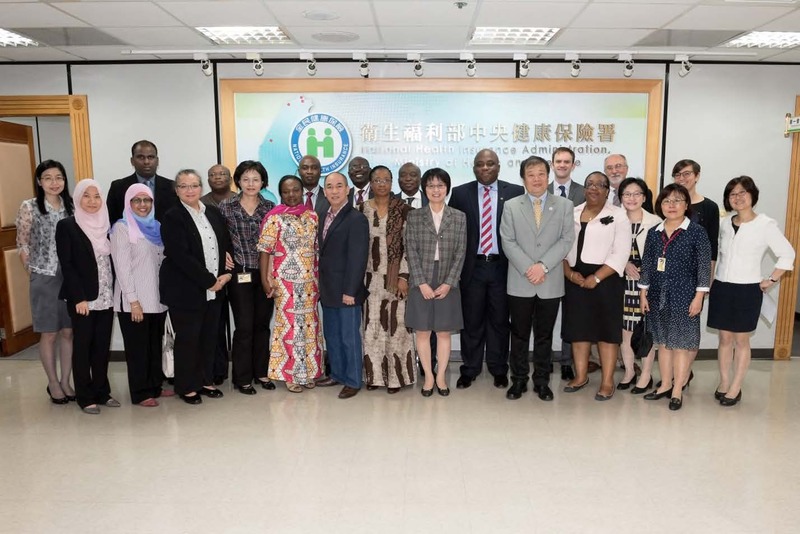 During the week-long exchange, the Ghanaian delegation attended the two-day NHI 20th Anniversary Symposium and Round Table, participated in a three-day course led by Taiwan NHI staff, and made field trips to regional health offices. HFG team members Chris Lovelace, Nathan Blanchet, and Sasha Frankel accompanied the delegation. On the final day of the course, participants visited Taipei’s regional health insurance offices and witnessed firsthand the rigorous clinical review processes of Taiwan’s NHI. Later, participants also visited a private hospital (part of NHI) to observe how clinicians and patients interact with the IT systems in place. Ghana’s NHIA Deputy Director of Operations Nathaniel Otoo said the visit “reinforced for me what we are already doing right,” but that the NHIA still has room to strengthen provider payment, quality measurement, and how IT is positioned in the health system. During the three-day study course, participants discussed both short-term and longer-term actions that could be taken in Ghana based on the materials being shared, including the development of a feedback loop with providers using facility data. 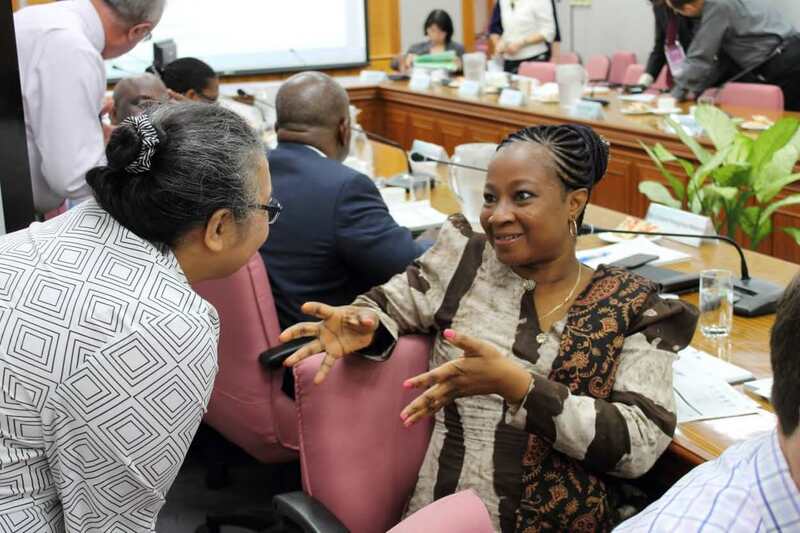 Dr. Afisah Zakariah, Ghana Ministry of Health, speaks with Rosita Halina Tan Hussein, Malaysia Ministry of Health. The symposium also featured prominent health economists and health insurance experts who discussed Taiwan NHI’s successes since its inception and the challenges the system currently faces. Discussants used country experiences from the Organization for Economic Co-operation and Development and the Asia region to propose possible alternative paths for progressing toward UHC. Following the NHI’s 20th anniversary celebration, the Ghanaian delegation together with delegations from Malaysia, South Africa, Nigeria, and the Philippines, participated in a more in-depth three-day course led by Taiwan NHI staff on the organization’s operations across a variety of areas. Content was tailored to the specific interests of the Ghanaian delegation and subjects included: data warehousing; quality measurement; indicator development; provider profiling; and provider payment within the global budgeting system. During the course, the Ghanaian delegation was able to engage directly with Taiwan NHI staff. Participants asked clarifying questions to better understand the day-to-day challenges faced and operations needed for each function. HFG is working with Ghana’s NHIA to strengthen its capacity for proactive, evidence-based decision making through three specific projects: facilitating the creation of a management dashboard for important organizational indicators; strengthening the capacity to perform monitoring and evaluation (M&E) and assisting in the production of the organization’s first M&E policy; and providing ongoing support to institutionalize operations research within the NHIA.